Do all 3 of them include both discs. I stopped buying records in 2014 when my record player broke and I've never bothered to get a new one, but here are the Beatles records I've acquired. 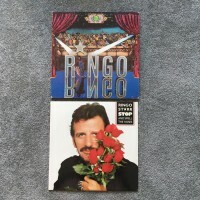 You should try to get one, they can be very cheap if you find one at a yard sale or thrift shop or if you don't want to, you should either sell those or give them to someone here, no point of having all of that vinyl if you can't play it. I like having vinyl I can't play. It's not about the practicality - it's about the aesthetic. I'll probably get A Hard Day's Night , Help ! and Please Please Me next. Will get Walls And Bridges next. @Joe I wonder what your Beatles vinyl collection is. If I had to guess, you probably have a lot since you seem to enjoy The Beatles and you don't seem like one of those I'll just get it off the internet for free type of people, so I'm guessing you have at least The Beatles In Mono and the stereo box sets, as well as possibly some original copies, singles, and maybe some other stuff as well. I don't have many singles, just a few I picked up years ago (including the Beatles Movie Medley, for some reason). But I do have quite a few original LP mono pressings that belonged to my parents, plus others I bought when I was a teenager when they were less than £5 (those were the days), and a bunch of EPs including MMT. I've also got my mum's old fan club flexi-discs from 1963 and 64. The best thing I ever bought was the Let It Be box set for £20, with the book in almost mint condition. 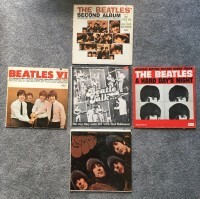 Of the reissues/later releases, I have the mono and stereo boxes, plus Anthology 1 , 2 and 3, the two BBC albums, Love, Let It Be ... Naked, YSS, 1 and the new (and old) Hollywood Bowl on vinyl. I have all the original Lennon solo albums (from JL/POB onwards), and a handful of McCartney and Harrison ones (Ram , Band On The Run , Dark Horse, Bangla Desh). I have a few more from the McCartney/Wings archive collection, though I don't yet have Flowers In The Dirt . Probably a few others lurking in the collection that I've forgotten about. Since I hit 100 Beatles records and I'm not gonna be here for a while, here's an update on the collection. *Note: Any records that don't have picture covers will be listed at the bottom by row from left to right. Row 2 (John): Instant Karma /Who Has Seen The Wind? Man @William Shears Campbell I'm super jealous of that collection! I can't find anything close to that quantity of Beatles records at my local shop. Yeah there's a couple of stores down here. The one I usually go to generally has a pretty descent Beatles selection. The other one that's far away usually is run dry on Beatles stuff, although they have their moments. I've sometimes found that one record that the other store didn't have over there. Although I'm not sure how good the record stores will be when I go up to college in two years. So my collection might see a slow down in growth when I get back. Why would you count a double album as 2 albums, i could understand for albums like Use Your Illusion but i don't think i would count an album like The Beatles, The Wall, or Live Killers as 2, it just seems unfair because both discs are important, missing one of the discs would make the album lose significant value. Well The Beatles, for example, is one album that countains 2 records, so it is 2 records. I mentioned this in the Albums You've Recently Bought topic, but I recently got a 1965 original copy of Help ! It's a bit old and it's in mono but it's still a lucky find. I've started my Beatles Vinyl collection on Friday! 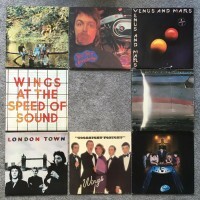 Ok, so far I haven't got an actual Beatles record but I got Wings At The Speed Of Sound , Ringo, and Venus And Mars on vinyl in a second-hand shop in Copenhagen for less than 5 Euro all in all! Especially Ringo has been a great listen, and the cover is full of details and there is also a booklet with beautiful drawings of Klaus Voorman, all together lead to me being lost in another world for about half an hour.